Leeds College of Music is welcoming applications for young musicians to take place in the newly assembled Generation Big Band. Generation Big Band at Leeds College of Music aims to bring together excellence across all generations of the Yorkshire jazz community. Using cutting edge arrangements the band will consist of alumni who are working professionally in the music business, existing LCoM conservatoire students, along with up and coming young musicians who show great potential. Whilst this is a three-tier ensemble the emphasis is on quality and an opportunity to bring together the best of the best. 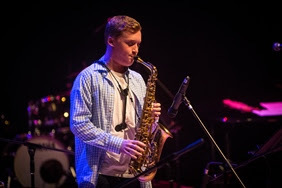 Through the audition process we are excited about reaching out especially to the younger jazz community and bringing together musicians who are passionate about improvising. Whilst places will be limited, this is a chance to connect with you, so please apply for an audition if you are interested – it might lead to other things. The fee for young musicians is £125. The deadline for applications is Midday on Wednesday 23rd November. Auditions will then take place on November 26th. There are 6 places available and while they would expect to receive applications from musicians aged over 14, they are open to applications from younger musicians too. Congratulations to LCoM for this exciting initiative - bringing generations of musicians together to share music and learn from each other is a great idea! For more information, visit the LCoM website.